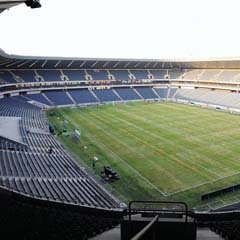 Cape Town - Orlando Pirates home ground will officially be known as Lafarge Orlando Stadium from next season. According to KickOff, rights for the new naming have been agreed upon with the buildings material manufacturing company, Lafarge South Africa. It has been revealed that the deal was struck in February and transformation is already underway in Soweto. The official launch of the renaming is set to take place in May. Stadium Management South Africa CEO, Jacques Grobbelaar, looks forward to seeing what Lagarge can do to uplift the community in and around Soweto. “There is good brand synergy between Lafarge South Africa and the Orlando Stadium: in particular in their long-standing commitments to sustainable development in local communities,” said Grobbelaar.